A woman laboring on the ball. Illustrated by Megan Gnekow. I received a call from J at 1:00 AM, just as I was returning home from a night out with friends. J had been in labor for three hours and was now needing my assistance. I came home and packed up a few things. Brushed my teeth and tried to make sense of my hair. Not a stitch of make-up and I couldn’t even remember if I had showered that day. Oh, well, too late now. I changed my clothes, grabbed my doula bag and headed out the door. When I arrived at their house, F, J’s husband, was waiting for me at the door. J was in the living room sitting on the ball. Yo Yo Ma was playing in the background and candles were lit. The grandfather clocked chimed just as I sat down. 1:30 AM. J’s contractions were coming every 5 to 8 minutes and were about 45 seconds long. From the look of things, I assumed J was still in early labor. She was doing great. Still smiling in between contractions. No back labor, no nausea. By 2:30 AM, J’s contractions had spaced out considerably. I was told that this may occur. Breech labors may have sporadic contractions without a consistent pattern. I was really grateful for this information because J’s labor was following suite. Since her contractions were now coming about every 15 minutes, J was feeling like a watched pot waiting to boil, so I suggested that she try to get some sleep, or at least a little rest. J and F went to their room and I laid down on the couch and tried to nap. Of course, I couldn’t sleep, so I rested and listened for any stirring from J’s room. At 3:15 AM I went to check on J. She was leaning across the ball swaying between her contractions. Her contractions were coming every seven minutes or so. I spent the next hour helping J ride through her contractions, offering juice, massage, encouragement and position suggestions. J was most comfortable squatting through her contractions, which was perfect. 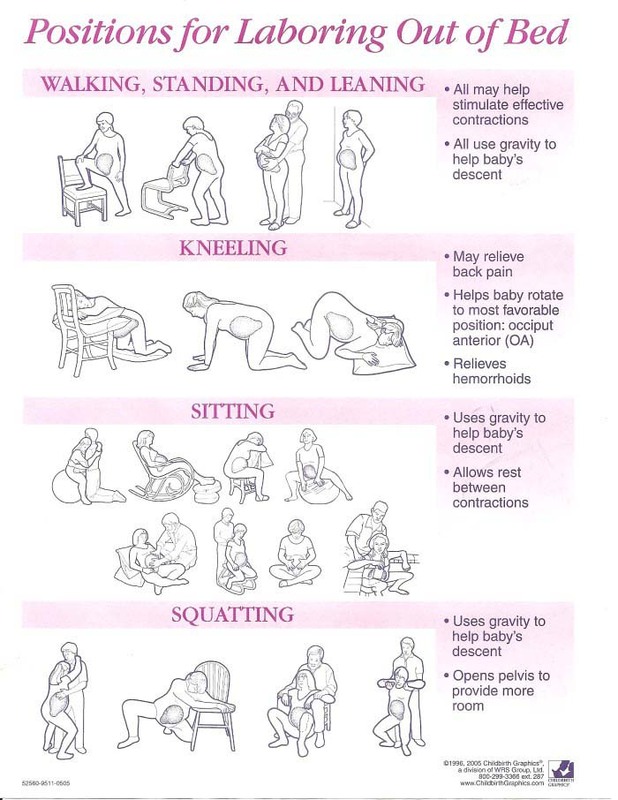 During labor squatting can open the pelvis by up to 2 centimeters, which helps give room for the baby to come down. J also really made use of a lot of acupressure points during her contractions. There’s a wonderful pressure point above the ankle that can almost make you feel as though you’re not contracting. F was amazing with his wife. He wanted to be a part of assisting as much as possible. I joked that he should become a doula and he thought that it was a good idea. He was near his wife constantly. Offering soothing words, reassuring touches and strong support. There were also lots of quiet meditative moments during the next few hours. Low lighting and aromatherapy, as well as soothing music playing made it feel like a spa environment. By early morning J’s contractions were still not consistent, I was beginning to become concerned that J’s labor was stalling out. Even though I knew that breech labor can be sporadic it began to feel worrisome to me. And since J had been in labor for 10 hours by this point, without her cervix being checked there was no way of knowing for sure how well or fast she was progressing, especially since her contractions weren’t gaining speed or intensity. I suggested that we go outside and take a walk. J’s mother had made a beautiful garden out of her back yard, full of fresh herbs and flowers and little fountains. We brought out some music, chose something with a little more beat to it (the pace of music can have an effect on our labor) and J, F and I started walking through the garden. J’s mother planted lemon verbena. So, we picked a few leaves and enjoyed it’s heady fragrance. With Italian samba music playing in the background and the sun just beginning to glow we greeted the morning, knowing that we would welcome Sofia into the world that day. J was incredibly calm, laboring at home really helped her stay in a place of trust and peace. F shared how he loved the process of birth. It demanded that you release your control and simply be present in the moment, he shared how he felt it was a lesson for him to remember for life. He was right, and it was good for all of us to remember this after a long sleepless night. After some time spent outside J began to feel restless. That’s when I suggested we prepare a nice warm bath for her and let her have some quiet space to herself. J agreed. I prepared the bath, turned the lights off, lit some candles and encouraged J to rest if she could, and not to think about her contractions or how she was progressing. After some medative time in the tub with contractions coming in every 8 minutes or so, J felt ready to move to a new spot to labor. That’s when we moved back into to J’s bedroom and since laying down didn’t feel good to J, after the bath, I set her up in a semi-sitting position that allowed for gravity to work its magic while allowing J enough comfort to sleep in between contractions. J listened to some meditative music on her iPod, and finally got some much-needed sleep in between her (now very spaced out) contractions, and so did the rest of us. By 12:30 PM, after an hour or so of sleep (with only three brief contractions in that hour), J finally started having regular contractions again, and the good news is that they stayed that way for two hours. That’s when things started to really heat up. 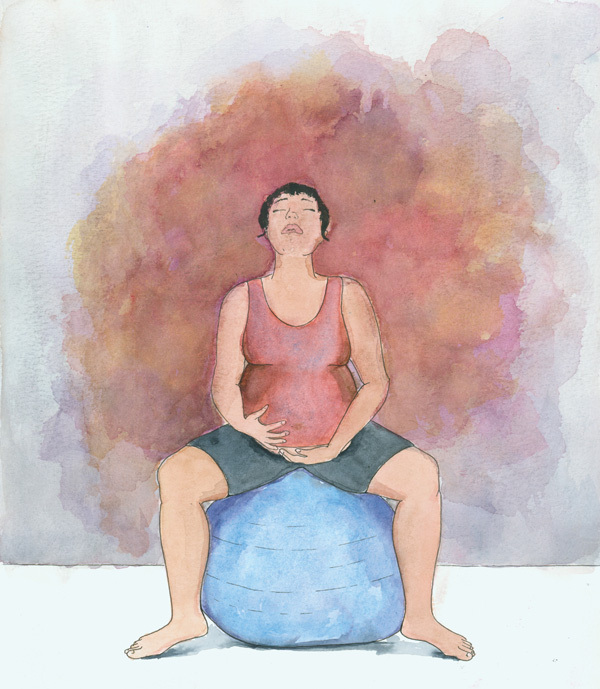 J was sitting on the ball and rotating her hips between contractions and when a contraction would come, I held on to J’s shoulders and literally bounced her on the ball through the contraction while her husband firmly stroked her arms up and down. I remember at one point saying to J, “Your body is doing exactly what it should be doing,” and then suddenly she burst into tears. I mean bust-a-gut-open sobs. I felt this was just what she needed. I encouraged her to cry it all out. I felt that perhaps there was something holding her back (keeping in mind our talk a few days ago about her apprehension of being a mother) and that she needed this emotional release in order to move forward in her labor. I knew after she did this, without question, that she would birth her baby vaginally. About 45 minutes or so of these intense contractions, coming every three minutes, I began to feel it was time to leave for the hospital. I mentioned it to F so that he could pack up the car and brought up the idea with J. Now that her contractions were finally steady I knew we could get to the hospital and they wouldn’t stall out. You see, J strongly disliked hospitals and so, with that in mind, I wanted to be sure that she was cookin’ before we went there. You see, adrenaline has the opposite effect of oxytocin in labor and it actually slows down labor, it’s part of the fight or flight response our body has, so if we become afraid or nervous our labor can slow or even stop. Which will sometimes happen if you change your environment too soon in labor. J let me know she was ready, and at 3:30 PM we left for Denton Presbyterian Hospital. Just as we arrived at the hospital, the sky fell with more rain than we had seen in weeks. Joy I can’t wait to read more! I had a dad who should be a doula too, it’s so neat to see the husbands so involved and trusting birth.